Programs are free for Members and included with admission for visitors, unless otherwise noted. To see a complete listing of the Museum’s programs, visit janm.org/events. 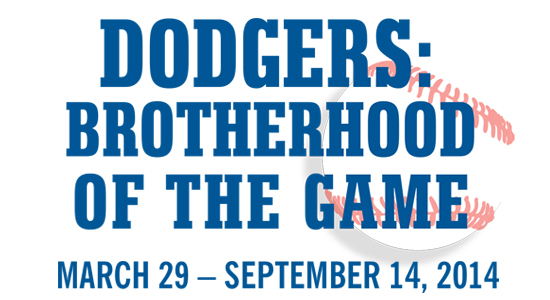 Upper Level Members are invited to join us to celebrate the opening of the Dodgers: Brotherhood of the Game exhibition. Dodgers: Brotherhood of the Game opens. Dodgers: Brotherhood of the Game curator Mark Langill (Dodgers Team Historian & Publications Editor) will moderate a panel which includes Margaret Narumi (NHK Producer), Tomas Benitez (Baseball Reliquary), Steve Han (KoreAm Journal) and Eric Dearborn (Baseball Photographer) in a discussion about Hideo Nomo, Fernando Valenzuela, Jackie Robinson, and Chan Ho Park. Mark Langill is the Team Historian and Publications Editor of the Los Angeles Dodgers. A member of the front office since 1994, Langill previously covered the ballclub for the Pasadena Star-News from 1989 to 1993. The Cal State Northridge graduate has written five books about the team, including Game of My Life: Dodgers. Margaret Narumi was born in Tokyo, Japan and moved to Los Angeles during kindergarden. She graduated from UCLA with a Bachelor's in Political Science, and, pursued a Master's in Political Science at Waseda University in Tokyo. While at Waseda, she interpreted for the U.S.-Japan Collegiate Championships, her first taste of baseball, and, upon returning back to Los Angeles, joined NHK, Japan's sole public broadcaster. She currently covers MLB broadcasts and is a Producer for NHK Cosmomedia America. Tomas Benitez was born and raised in East LA. He has been an arts and cultural advocate for nearly forty years, working mostly in community settings and non-profit organizations. He is Chairman of the Board of the Latino Arts Network, and is a former commissioner with the Los Angeles County Arts Commission. He is a contributing writer and founding member of the Baseball Reliquary’s Latino Baseball History Project, a study of the Latino experience in America through the lens of baseball. Steve Han is a sportswriter for the nationally circulated English-language Korean American magazine KoreAm Journal and South Korea's largest circulated sports daily newspaper Sports Chosun. He has written cover stories on L.A. Dodgers pitcher Hyun-Jin Ryu and Texas Rangers outfielder Shin-Soo Choo for KoreAm while working as a Dodgers beat writer for Sports Chosun. Eric Dearborn is the current team photographer for the Dodgers’-affiliated minor league baseball team, the Rancho Cucamonga Quakes. Apart from being an expert on baseball history, he is also a model and actor who has appeared on shows such as All My Children, CSI Miami and ads for Gap, Old Navy, Tommy Hilfiger, Aeropostale, Abercrombie & Fitch and many more. Scott Akasaki, the Dodgers’ Director of Team Travel, will engage former team manager and Hall-of-Famer Tommy Lasorda in an intimate discussion of Lasorda’s role as a baseball ambassador to Japan and other countries. Lasorda began his career as a major league player before moving on to a storied lifelong association with the Dodgers as coach, manager, and finally executive. Akasaki has served as Dodgers’ Director of Team Travel for ten seasons and was the first Asian American to be named to the post in Major League history. Pre-sale: $16 members, $20 non-members. Purchase pre-sale tickets by clicking the link below. At Door: $20 members, $24 non-members. Cash only. Dodgers: Brotherhood of the Game closes.